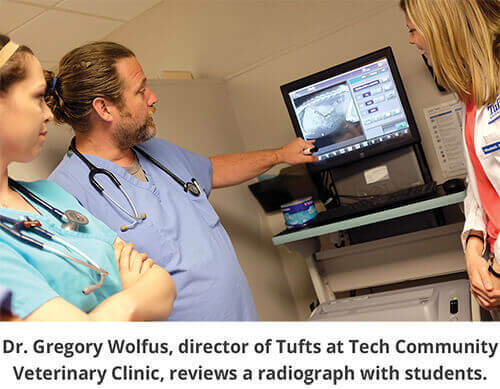 Tufts at Tech Community Veterinary Clinic is the nation’s first on–the–job veterinary clinic at a high school, developed in collaboration with a veterinary school. This program is a “feel–good” on so many levels. 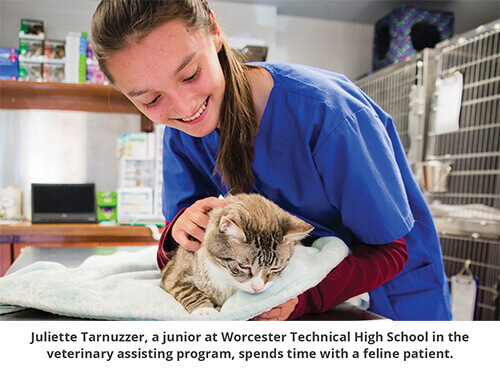 It allows students in the Veterinary Assisting program at the Worcester Technical High School to gain hands-on experience while working toward a traditional diploma and an Approved Veterinary Assistant (AVA) certificate from the National Association of Veterinary Technicians in America (NAVTA). The mentors for the high school students are fourth–year students from Cummings School of Veterinary Medicine at Tufts University, who are clearly getting real–life experience up close and personal. Arguably the most important, the animals seen at this unique clinic belong to pet caretakers who reside in the local economically depressed community. In order to receive care, caretakers must demonstrate need. “This program works on so many layers,” says Dr. Greg Wolfus, clinical assistant professor at Cummings and Director of Tufts at Tech. Wolfus says, that in his opinion, the life lessons learned are as important as actually implementing what veterinary students have learned in classrooms about diagnostics and techniques. In just a few weeks’ time, Maddox and her classmates diagnosed and followed up with surgery for everything from pyometra to entropion to all sorts of dental procedures to removing a mass from a cat’s face to many low–cost spay/neuters. And euthanasia is also a reality in the clinic. Pam Houde, CVT is there to assist DVM students and teach blood draws, induction, positioning for radiographs, and so much more, including asking the right questions to be efficient in a real clinical setting. Houde has been a part of Tufts at Tech for over four years. High school students take client histories, assist the veterinary students to handle patients, help to prep animals for surgery, learn about reading lab reports, help to clean and take future appointments. Worcester Technical High School offers other real–life programs including carpentry, automobile technology, web development, culinary arts, allied health to learn to become a certified nursing assistant and cosmetology. About 99 percent of the program’s grads have passed the NAVTA test for becoming an AVA since the test became part of the program in 2010. It’s unclear how many of the high school grads actually land jobs in the veterinary field—only because it’s a challenge to track so many people post–graduation. But certainly many grads are now working in veterinary medicine. And the high school students are having fun while learning, a goal not always achieved in an educational setting. This is likely because the students are enjoying working with animals and relate to the vet students who aren’t all that much older.